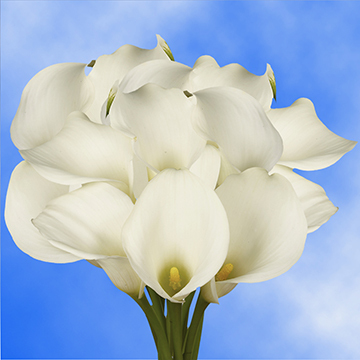 Symbolizing "magnificent beauty, Calla Lilies Flower White are easy to arrange and guaranteed to make an impression. They have a large trumpet-shaped bloom that rests upon a smooth stem. The place to look for such superb lilies is at Globalrose.com. 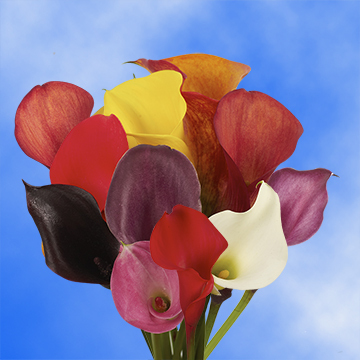 One of the most popular blossoms in a wedding bouquet is the Calla Lilies Flower White. No other floret represents purity more than the lily and its beauty will enhance your child's first communion celebration. Spring is the season when Christians observe their holiest holiday and this floret will augment any Easter floral arrangement. At Globalrose.com, we cut your orders 3-4 days before you receive them, which is more than a week before other wholesale retailers. We inspect each bloom for excellence and bring you the no worry promise that you'll be pleased and delighted with your floral purchases. Globalrose.com wants you to become one of our returning customers for years to come.